The perfect book for busy Pagans! The magick spells, rituals and meditations in this interactive book transform time-honoured traditions into simple ceremony. Use the power of your intent and the Wiccan Wheel of the Year to find love, success, creativity and better health. Suitable for beginners, unfamiliar terms are easily identified (capitalized and/or bolded) and explained. 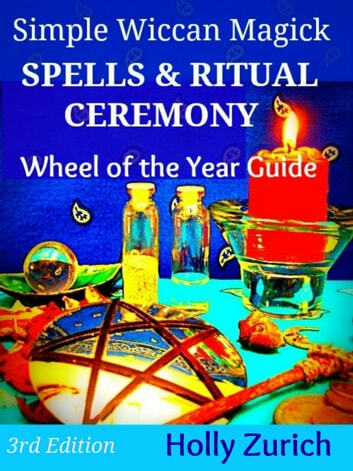 Why sift through books of Wicca history and lore when Simple Wiccan Spells and Ritual Ceremony includes useful references for all levels of practitioners. Supplies such as candles and herbes are listed for each festival and for the entire Wheel of the Year. Easy seasonal menus and recipes are included. Ideal for ceremony work around the altar, alone or in a group, Simple Wiccan Spells and Ritual Ceremony can be used on its own or as an addition to other witchcraft books. The background information helps you create personalized rituals, potions and spells. All correspondences have been thoroughly researched and tested and are in keeping with traditional practices. They have been presented in a straightforward format, designed for today’s busy lifestyle.